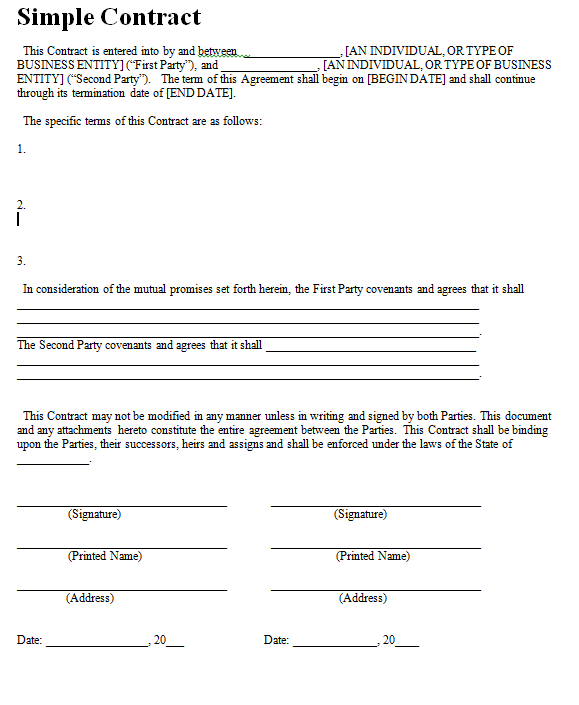 This Contract is entered into by and between ________________, [AN INDIVIDUAL, OR TYPE OF BUSINESS ENTITY] (“First Party”), and ________________, [AN INDIVIDUAL, OR TYPE OF BUSINESS ENTITY] (“Second Party”). The term of this Agreement shall begin on [BEGIN DATE] and shall continue through its termination date of [END DATE]. In consideration of the mutual promises set forth herein, the First Party covenants and agrees that it shall _____________________________________________________________________________ _____________________________________________________________________________ _____________________________________________________________________________. The Second Party covenants and agrees that it shall ___________________________________ _____________________________________________________________________________ _____________________________________________________________________________. This Contract may not be modified in any manner unless in writing and signed by both Parties. This document and any attachments hereto constitute the entire agreement between the Parties. This Contract shall be binding upon the Parties, their successors, heirs and assigns and shall be enforced under the laws of the State of ____________.